Michael Steele Thinks Black People Are Stupid | Michael Steele Thinks Black People Are Stupid – The Republic of T.
Well, at least the one’s that live and vote in Maryland. Not to put too fine a point on it, but that’s the only reason I can think of for some of his campaign moves. The man is dancing as fast as he can, moving his feet and hoping that he keeps it up African American voters won’t where he stands; or who he really is, for that matter. One minute he’s not really a Republican. Two steps later he wants you to think he’s a Democrat. (A Rove fundraiser and $500,000 from Bush say otherwise.) Turn around, and the Democrats are the party of slavery and segregation. Well. I can understand that from a tactical point of view, and it might work. But running ads like this one, in an attempt to fool people, instead insults their intelligence. Steve Klein, a senior researcher with the Atlanta-based King Center, said Thursday that King never endorsed candidates from either party. “I think it’s highly inaccurate to say he was a Republican because there’s really no evidence,” Klein said. A King biographer, Taylor Branch, also said Thursday that King was nonpartisan. The KKK, never a political party, was a racist group of white men that started in the South after the Civil War, when Republicans were almost unheard of in former Confederate states. The mainstream Democratic Party never endorsed the Klan nor claimed to have founded it. I’m not even going to go down the path of asking if Steele or the National Black Republican Association actually believe this — they may have convinced themselves of it by now — but do they actually think a significant number of African Americans will be so ignorant of history as to buy this? I will grant them one thing. Abraham Lincoln did sign the Emancipation proclamation, and I’ll even ascribe his statements on white superiority to the times he lived in. But the rest doesn’t pass the laugh test, and anyone who buys it would have to manage the task of ignoring both the past and the present at the same time. Ronald Walters, a political scientist at the University of Maryland, said he heard the ad while driving yesterday and found the historical references to be distortions. “It is a totally fallacious rendition of the platform of the parties because, in effect, what happened is, the two parties essentially switched ideology,” Walters said. Walters said he did not think it would help Steele win votes and could hurt him among those who are offended. The professor is right on the first count. (And I hope he’s right on the part about people being offended.) I’m not a college professor, but I’ll toss out a pop quiz anyway. Anybody ever heard of the Dixiecrats? Nevermind, just put your pencils down. They were the segregationists who peeled off from the Democrats in 1948, because black folks were getting too uppity even then, and ran their own presidential candidate: Strom Thurmond. Well, which party did Strom Thurmond end up in? And, yes. I’m aware of Byrd. Thurmond never renounced his segregationist beliefs. Byrd, at least, did. We shouldn’t be too hard on Strom though. He really did love black folks, in his way. Still, went to his grave a Republican and an unrepentant segregationist. Now, yes, the 15th amendment did give freed slaves the right to vote back in 1870. And yes, it was ratified with Republican support then. But for the sake of the Union, and some semblance of peace with “unreconstructed” Southern Dems, most blacks were grandfathered out of that right, with some help from the Klan and none help from (Republican) president Rutherford Hayes. Back to the present. When the migration of the Dixiecrats into the modern Republican party finished, I don’t now. But by the time of Zell Miller’s appearance at the Republican Convention I’d say it was pretty much complete. And it takes a conservative (albeit a gay one) to remind us of Zell’s past. Then you see Zell Miller, his face rigid with anger, his eyes blazing with years of frustration as his Dixiecrat vision became slowly eclipsed among the Democrats. Remember who this man is: once a proud supporter of racial segregation, a man who lambasted LBJ for selling his soul to the negroes. Yeah. Zell also worked for Lester Maddox back in the day, a former governor of Georgia famous for his “axe-handle campaign,” named for his weapon of choice when chasing out blacks who tried to integrate his restaurant. Zell may well have been the last Dixiecrat out of the Democratic party, in all but name. But never mind Zell. How’s the party of Lincoln doing today? Well, you don’t find many Democrats publicly yearning (or at least seeming to) for the days of segregation, or even the confederacy, but Republicans? Well, there was Trent Lott’s slip-o-the-lip at that party for Strom Thurmond, when he seemed to regret that American failed to elect an avowed segregationist in 1948. That was a while back, but just this week Georgia’s Republican Senator Saxby Chambliss seemed almost disappointed that the Confederacy didn’t win the Civil War. Of course, you can allow yourself to think that might not have been such a bad thing for blacks in the long run anyway. There are at least a few Republicans who think slavery was a blessing. A good number of Republican Senators thought slavery wasn’t worth apologizing for. Surely slave owners would have brought the system to an end in a generation or three. And former Republican Senator (and former segregationist) Jesse Helms wrote in his memoir that southerners would have given up segregation, eventually, and it’s just a shame we didn’t wait to find out how soon. Oh, and this is the party that’s tried to revive the poll tax in Georgia and Missouri. Now, I’m not a history expert, but I know all of this. The only thing I had to look up were the links. The Steele commercials suggest two possibilities. 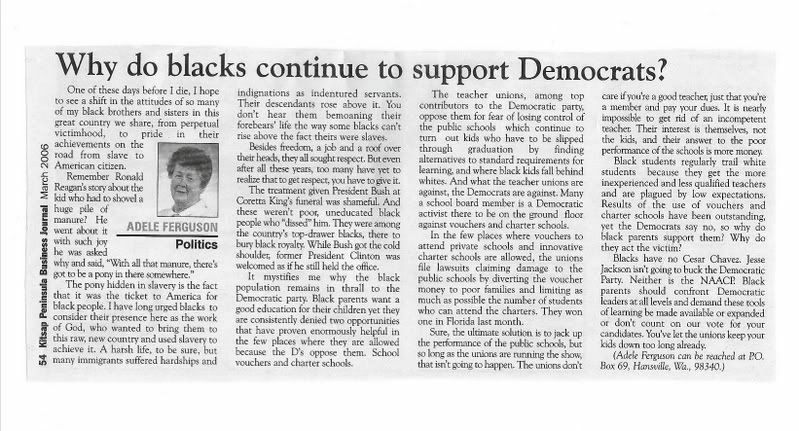 Either Steele and the National Black Republican Association doesn’t know this stuff, or they don’ think most African Americans in Maryland know this stuff. If the former is true, then it’s Steele and the Black Republicans who are in trouble. If both are true, and what Steele and the Black Republican thik about the rest of us is true? Well. We’re all in trouble. Now, if the signs said “Steele DemocratS” or “Another Steele Democrat” it would not be fraudulent. Some Democrats support and will vote for Steele. 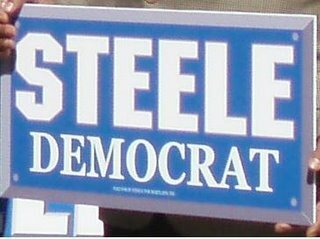 But the typefaces of the signs suggests not “[a] Steele Democrat” but “Steele: Democrat.” The “Steele” on the sign is in “Metallic New Wingnut” whereas the centered “Democrat” below is in a smaller serif type, suggesting that the latter is a subheader for the former. Test: Replace “Democrat” with “Anti-Semite” or “Communist.” Does the new sign slander Steele? If so, then the former sign is a fraud. If not, it means that the sign owner is a Communist or Anti-Semite who supports Steele, i.e. bulls%%%. I am not Black, but listening to that ad made me furious. It’s absolutely disgusting, and shameless. Steele also was misleading about advertising that he has a “Mfume” endorsement. He does, but it’s Kweisi Mfume’s son and not the man himself who gave the endorsement. Kweisi Mfume’s press release when he conceded said that he supports Cardin. Steele’s running like a man who’s ashamed of his actual record. I found out about your blog via a link to my blog from, “The Blog….And the Bullet”. Although there are two things I must quibble with you about. In order for a people to be offended, they would have to know their history. All of your post was well written, and before you came to certain sections in your post, I was already saying the answers, or better yet, saying out loud, all the history of BOTH the Dems and Repubs, (slavery, segregation, the Dred Scott Case [hadn’t heard/read the phrase, “rights no white man is bound to respect”, in a long time]. ): the filthy trash parties that have sold blacks down the river so many numbers of times, that I have long since lost count. But, I digress. In order for a people to be offended, they must know their history. And with the sheer lack of knowledge of their history that I have found MANY young blacks showing, well, it is enough for me to want to do more than lose my religion. And it wouldn’t be any better if there are blacks my age who do not know their history. Such is the reason there is so much nihilism among the young blacks of today; and quite a few older ones as well. When you know your history, NO ONE can ef with you. And in knowing your history, you will be stronger than your enemy. Which is why I have taken it upon myself to teach a young black lady of her glorious history in this country. The things she does not know about her black ancestors makes me want to cry. But, crying will not stop ignorance. Only passion with patience and kindness, will strengthen this young lady in learning that she came from a race that has survived odds that would have destroyed lesser people. And that is my testament to all my black ancestors who came before me. I owe them a debt that I can never repay. And the best way to try and repay that debt is to instill into this young lady all she should know of her history. Buying her books on black history. Telling her of the accomplishments of black Americans. Imparting to her that she comes from a proud race of people who were more patriotic, more Crhistian, more law-abiding, more humane than those whose race sought to destroy hers. Better to light a candle, than curse the darkness. And that is what I hope to do with this young lady. “If the former is true, then it’s Steele and the Black Republicans who are in trouble. If both are true, and what Steele and the Black Republican thik about the rest of us is true? We are ALL in trouble. Why don’t Steele go and help his ex-brother in law out ,Mike Tyson?Anyone who’s a friend of Sean Klannity, is no friend of mine.